Swedish paleontologists were the first scientists to go to China in the early 20th century, and they carried out a series of expeditions in collaboration with Chinese colleagues. They found large numbers of fossils of dinosaurs and other vertebrates. The material was sent to Sweden and the well-known paleontologist Carl Wiman, who identified and described the fossils. But when the direction of research changed after Wiman's death, 40 cartons were left unopened and forgotten -- until know. In recent weeks, they have been opened by Per Ahlberg, his colleague Martin Kundrát, and Museum Director Jan Ove Ebbestad, who had drawn attention to the cartons in the storeroom at the Museum of Evolution. Recently, they have gone through the material together with leading Chinese paleontologists from the Beijing Institute of Vertebrate Paleontology and Paleoanthropology, who were excited when their Swedish colleagues contacted them. The Museum of Evolution has the best collection of Chinese fossils of dinosaurs and other vertebrates outside of China, and the contents of the 40 cartons further enhance the value of the collection. The fossil material comes from several different areas in China. 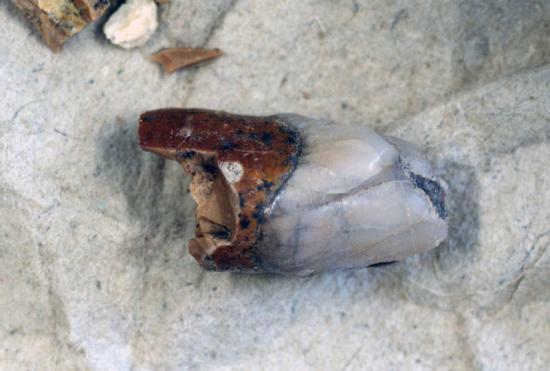 In Zhoukoudian, southwest of Beijing, a canine tooth was found from Homo erectus -- that is, Peking man. Then rich finds were made of skulls and other skeletal parts, but all of this disappeared in a mysterious way during World War II. All that remains in China today are five teeth and a few pieces of skull bone that were found in the 1950s and 1960s. So the three teeth from Peking man at the Museum of Evolution have been regarded as being among the most valuable parts of the collection. And now they have uncovered a fourth tooth -- and it is untouched. According to Professor Liu Wu from the Chinese Academy of Sciences, it is a fractured, but otherwise well-preserved canine tooth. "This is an extremely important find. It is the only canine tooth in existence. It can yield important information about how Homo erectus lived in China," he says. The tooth is to be examined with modern technology. By studying how the tooth was worn down and looking at possible microscopic mineral granules from plant remains, it may be possible to puzzle out what Peking man ate. Combining this with the other material in the cartons, these scientists hope to be able to reconstruct some of the plant and animal life that existed in Peking man's environment.